Harper's recent statement that his goverment won't legalize loco weed here in Canada isn't because his base voters oppose it, it's not because the drug warrior zealots to our south would go even more nuts than they already are, it's because Canada's small time mom and pop marijuana industry is powering the rural economies of Canada. Worth $7 billion in BC alone, that's a lotta money. Some goes to the big boys, that's true, but the vast majority goes to thousands of little mom and pop operations in BC and all over Canada. When mom and pop growers spend their loonies it's at local stores, on bills and at the grocery market not the stock market. The tax boys get their cut over and over again. As 'The Toilet Bowl Theory of Economics' shows the GST/PST/HST taxes mean the government gets every one of the outlaw's loonies sooner or later. But before its all sucked up into taxes and corporate profits it circulates from person to person powering our local economies. Someday, like the other outdated 'boogie men' we'd been manipulated to fear, like gambling, alcohol, tobacco, coffee, etc. the 'sin' of pot will go up in smoke and the government will use it as another source of revenue. Until then we the people can enjoy our tokes and our green economy secure in the knowledge that whenever it's legalized it'll become just another crappy plastic corporate commodity. Until then folks everywhere will live 'the motaleros way'. Sometimes you don't need the words when the song speaks directly to your heart. Coast to coast to coast millions of TV's and radios in Canada will be tuned into the 99th Grey Cup game. 30,000 fans from all over Canada are partying in Vancouver. 60,000 will fill BC Place later this afternoon. Its a bonanza for the hotels, pubs and restaurants. 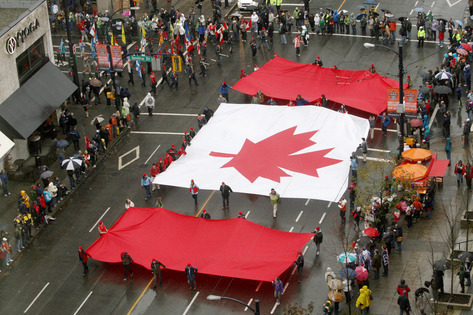 Every CFL team had its colors well represented in the crowds at yesterday's parade. It's like a traveling Mardi Gras, every year fans take their holidays to come to the party, this year its in Vancouver. Being an american by birth, an import in CFL terms, it took me awhile to convert to the Canadian game but now i'm on the bandwagon both for BC Lions and the CFL. It's a big place this Canada, lottsa space, in distance and culture, between BC-Newfoundland-Inuvik. But in a few hours the kickoff will be watched in all three and everywhere in between. The Grey Cup unities Canadians once a year, kinda reminds everyone to focus on our shared good fortune. 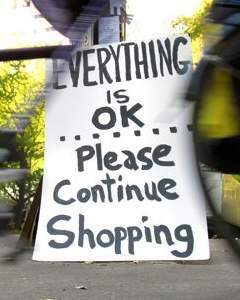 International 'Buy Nothing Day' has, like everyday, unfolded later here on the west coast of Canada than most places. We have breakfast while europe has dinner and while China sleeps, if it ever does. By midday here today it's already apparent that BND was either a huge success or a total failure depending on who you get your info from. At least 63 countries participated, hundreds of thousands worldwide staged some sort of action. Number of shoppers who stopped shopping=zero. Minds weren't changed, but the message was sent. Quitting shopping must be far more difficult than kicking drugs or booze. Our culture validates nothing more than consumption unless maybe its excess. Stopping conspicious consumption, genuinely wanting and being happy with less, growing and making our own, these are the ideas and actions that could hobble the runaway corporate agenda. The Empire appears as a many headed hydra, its money and power won't be given away, its power lies in the control that fear instills. The power we have is in owning the ground. They need us more than we need them, and they know it. 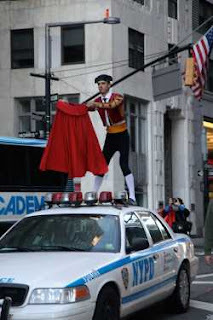 Every action, no matter how symbolic, that lifts the skirt hiding that truth is revolutionary and dangerous to the 1%. "Remember" as Timothy Leary said, "that you're only as old as the last time you changed your mind." It's hard to be optimistic on Black Friday. 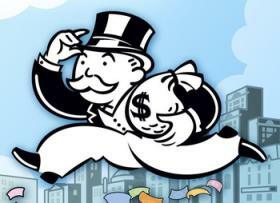 The malls are a madhouse, so many of my fellow north americans acting like puppets on casino capitialism's stage. But not everyone's at the mall, there are those who are protesting againt the puppetmasters and some folks just have better things to do like a walk with the dog [yum] or cleaning the gutters [yuck]. We, the 99%, hold all the cards but allow ourselves to be deluded and divided. Every exchange is driven by demand. Supply rises to meet that demand. We, the demanders, are the driving force behind the destruction of the planet's enviroment, behind the inequities that create starving children in Sudan and gluttonous consumption at the malls here. We, the demanders, create the 1% with our endless consumption. Will Shopping Save Us? - Shopping may be our real national pastime, but it comes at a price that is not advertised in the malls. i give thanks to the wind whipping the rain against the windows and sending the waves crashing over the seawall on this morning's walk. Thanks for the forest dancing in the wind, for the little birds at the birdfeeder, for my best friend Pancho, for another vertical day. Being lucky enough to have been born in 1948 gives lots to be thankful for. We grew up in a world of limitless possibility, the perfect time to be a dreamer, a time when kids were kicked out after breakfast and told to be back for lunch without a moment of terror about the unknown. i'm thankful mostly for my family, for my mom and the sacrifices she made as a single mom in an era long before it was common. How hard she must have worked on all those graveyard shifts to make a home and a life for us. Brilliant and beautiful, Betty Wiley gave me her best and i thank her with all my heart. Thanks too to my daughters who've been the proud focus of my adult life and provided its finest moments. We've been the lucky mud, from rock and roll to hoola hoops, those my age have watched pop culture as it popped. Now we're watching a new generation of mud awaken and begin again to realize another world is possible. We too thought we would change the world in our hippy-yippy past but change slipped through our fingers, change kept changing and now my thanks go out to the growing global resistance for re-awakening my hopes. Can We, the Greedy, the Lazy, the Fearful, Want Less? Wanting less is the central message of Buy Nothing Day. Wanting less is empathy in action. There is still a chance humans could change from the greedy, lazy, fearful mob we mostly are now into empathetic members of the living earth. The Vagas odds are real long, but not zero. 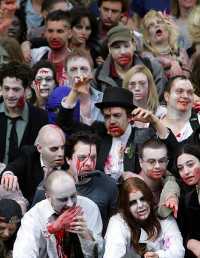 Symbolic actions this Black Friday like the Zombie Walk and Whirl-Mart are great mall theatre. They open a channel to a new way of thinking about the holidays, about our own consumption habits. Pogo like, we must acknowledge that we have seen the enemy and it's us. 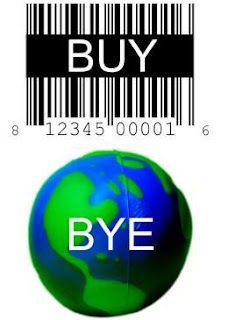 Adbusters update today extolls us all to use Buy Nothing Day as a springboard to #OCCUPYCHRISTMAS. There is only one earth, we cannot continue to consume its limited resources to satisfy our unlimited demands. The sooner we each confront our inner consumer the sooner the flora, fauna, microbes, minerals, forces and fairies we share this life with will step back from the precipice of disaster we're all looking over. Can we, the greedy, lazy, fearful primates, overcome our own worldview of entitlement? Can we want less? The real 99%, the non-human part, sure hope so. It's moving day at #Occupy Vancouver, they're moving on to the next phase they say on their website. They, and their fellow rebels, have changed the political discourse in first phase, my heart soars like an eagle. The next phase will see many different tactics including our individual recognition that we are part of the problem. There's as many viable tactics as there are tacticians. Resistance through non-cooperation is one non-violent tactic. Whether you're in the country, a small town, the city, the burbs, the root ideas remain the same: live by cash-stay out of debt-never buy on credit-save your money-buy local-work hard. Every act of resistance creates a whirlpool of downstream effects and each act awakens the actor. The corporations, like chinese handcuffs, hold on by the power of fear. If you stop retreating in fear, even for a second, the spell is broken. The freedom to live, hope and work towards your dreams is only one smart choice away. There is a fire burning in the forest of capitialism and it has plenty of fuel. 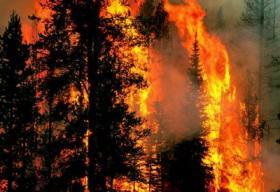 When it's a well fueled fire burning in a real forest the firefighters work towards containment. They try to use up the available fuel so that when the winds blow the resulting embers will have no chance of kindling a new breakout. The Empire seems not to have learned from this example. Instead of attempting to contain the worldwide anti-capitialist movement by removing the fuel of inequity that feeds it they've adopted violence and repression in response. 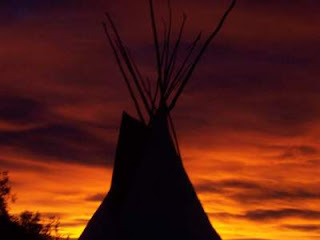 Every day the wind fans the flames from a new direction. Today in the US it's the UC Davis pepper spray blowing, in Egypt it's Tahrir Square exploding, riots in Athen's and Rome, the winds of repression are stiff, the fire is spreading quickly. Tomorow more evictions in more cities will spread the flames of change further still. Evicting the occupiers is doing the movement a huge favor, i'd personally like to thank them. Before the evictions their very name 'occupy' had them somewhat contained. The movement's flame is small when the bits of mud they camped on framed the discussion. Now it's the moral high ground they seek to occupy. The glowing embers set aloft by the evictions will hopefuly land in neighborhoods and back yards where new General Assemblies will convene, where the new horizontal awareness could lead to real communication among the, until now, divided 99%. Until then, until the fire burns in every community, we can take heart in the new flames large and small quickly fanning out in all directions. The batman like beaming of slogans at the Brooklyn Bridge march was perfect. OWS has a great sense of theater, today they've organized a a 24-hour "Occupy Bloomberg's Mansion Drum Circle and Love-In Art Show" outside the mayor's townhouse at 17 East 79th Street. Free drum lessons! During this morning's beach walk with the pack of dogs and their humans the topic of Buy Nothing Day came up. One fellow laughed. He, like me and millions of others living on the fringe, has as many buy nothing days as possible, this is truely a movement we at the fringe can embrace. Buy Nothing Day (BND) is an international day of protest against consumerism. 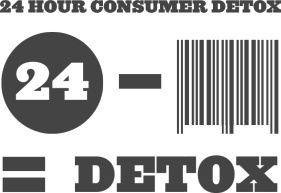 The first Buy Nothing Day was organized in Mexico in September 1992 as a day for society to examine the issue of over-consumption. This year BND is Nov 25 in North America. Nov 26: World Wide. More than 65 countries participate. As the UK group says, "Lock up your wallets and purses, cut up your credit cards and dump the love of your life - shopping." Like Move Your Money Day last week BND is a tool, of individual empowerment. They are a lever poised to lift the veil of consumerism one x-zombie at a time. Adbusters has for years promoted BND and now the occopiers are coming on board. It's depressing to watch the hords lined up to stampede the malls on Black Friday in the US and during the consumer season generally. The newest video game or smartphone, the shiniest bobble, still draws the zombie hordes. The awakening is spreading, slowly. The corporations, the 1%, live on the excesses-the wants not the needs-of the rest of us. Without the endless demands of consumers the veil would drop and the bonerack that seems, like the Wizard of Oz, so powerful would be exposed as the teetering lie it is. We are the consumers, we are opening our eyes, despite the hordes at the malls gobbling up needless crap-we are winning [i hope]. A dazzling lightshow manifesto splashed across the Verizon building last night as thousands of Occupy Wall Streeters marched across the Brooklyn Bridge. Cars honked in solidarity, and projections appeared on the side of the the building across the street, including "Occupy Earth," "You are part of a global uprising," OWS's "99%" logo and "We are winning." 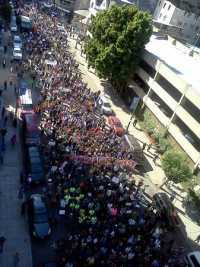 Yesterday thousands marched and held actions in solidarity with OWS around the world as well as across the US. Bloomberg's raids have succeeded in drawing ten times as many protesters into the streets. The same thing happened in Oakland last week. 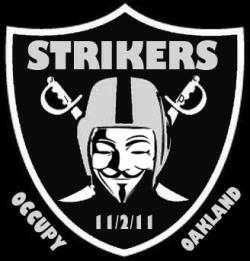 It seems the more violence the authorities use to repress the occupy movement the faster it grows. In LA yesterday a small group of protestors took over a key intersection and quickly caused traffic snarlup that shut down parts of the freeways and ground streets. 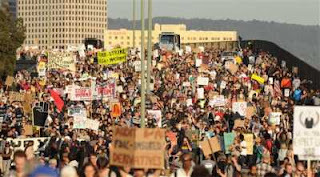 Occupy LA announced their intentions, the LAPD knew where and when it was coming, they responded immediately. Imagine the effect numerous small groups of independently oganized dancing and singing protestors could have at a few key intersections in any city at rush hour. The Yippies used this tactic back in the early 70's in Vancouver. Quick mini parties that today would be called flashmobs at major intersections. Many motorists would join the fun for a couple minutes. It was empowering, often inspiring, always musical and quick. Locally, Occupy Vancouver is jumping into community as well as global issues again today with its March Against Open-Net Salmon Farming Practices, they know that open-net fish farms break natural laws and are unsustainable. Homelesness, poverty, hunger, and fish farming are all connected with the larger global issues. In a short two months this 'idea', this 99% meme, has changed the game. We are part of a global resistance movement, it's growing every day, We Are Winning. Tens of thousands have turned out in NYC in support of OWS. Many more thousands are demostrating their support around the world. The occupy movement is far from dead but it is about to change tactics. 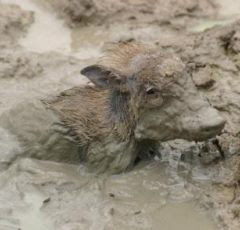 The original tactic of occupying small bits of mud was a vechile to propel the meme of inequity into the forfront of people's attention. It has succeeded wildly. But now the evil empire has countered with state violence and the mass media's attempt to turn the focus away from the large questions originally posed by the occupiers into local squabbles about red herrings like public safety, regulations and jurisdictions. Today's turnout is a statement, a validation really, that the original message of the occupy movement is being heard loud and clear, but not it's not the new tactic. The next move will be to go small. Next we'll see small independent cells organize into flashmobs that can appear without warning anywhere, can be secure by being entirely made up of trusted friends, can disappear just as easily, can continue to serve the stratedgy of education as a stepping stone to change. Not very encampment will be overpowered by local 'authorities', but most will. Those that survive will do so because they serve the needs of their local communities. Occupy Vancouver is one model that might survive. They are currently serving up to 1,800 meals a day to all comers and they are in talks with the city and provincial governments to establish housing for the endless stream of homeless who arrive at their site daily. The police are puppets, once they recognize their position relative to the puppetmasters events will change. The downfall of every empire in history includes the pivotal moment when the army of the rich realizes their emporer wears no clothes. It will happen again hopefully sooner rather than later. Meanwhile as today's communique from Culture Jammers HQ says: Now begins the second, visceral, canny, militant phase of our nonviolent march to real democracy. We regroup, lick our wounds and begin our counterattack as early as tomorrow. We will turn this winter into a training ground for precision disruptions – flashmobs, stink bombs, edgy theatrics – against the megacorps and the unrepentant 1%, a festival of resistance in the snow with, or without, an encampment that'll lay the tactical foundation for our Spring Offensive. The emerging cooperation among anti-capitialist movements showed its strenght as thousands of people in Berlin and Frankfurt took to the streets Saturday to protest the global financial crisis. The anger of the Occupy Wall Street and Indignants movements has spread to Germany. A similiar meeting of movements in Athens a few days ago reflect a global resistance movement coming together to face global problems. The goals of these far flung protestors are identical. Goals are achieved by way of good strategies. Strategies are accomplished by different successful tactics. Here in Canada the occupations, the tent city tactic, are being cleared by local 'authorities' each day. IMO the tent city tactic can only work when they begin to serve the particular needs of their local communities. Occupy Vancouver's daily 'free food for all' run by volunteers and supplied by donations is a great example. So is their focus on homelessness shown by yesterday's march. Just as each community's needs are different so will the strategies and tactics be different. If a small tent city occupation gets thrown out then, like in Halifax, the moral outrage shown locally can do as much or more to further the process of education central to your strategy. Maybe it is to cold in Regina to live in a tent all winter but Regina has local issues to build around. The goal is of building the world you want is being grown around the world by people who are learning to organize themselves and resist in the course of providing for one another. 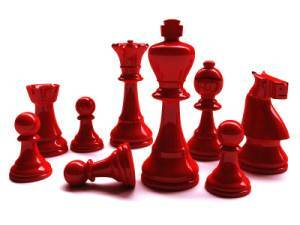 Not learning from the successes and failures of the strategies and tactics would be stupid. The Argentines and, to a lesser degree, the Greeks have built grassroots community bases that serve the needs of the people not the elites. Nither had encampments, though the indignants of Spain did, encampments are a tactic to be used, or not, in the service of a strategy designed to accomplish a goal. On Wend. 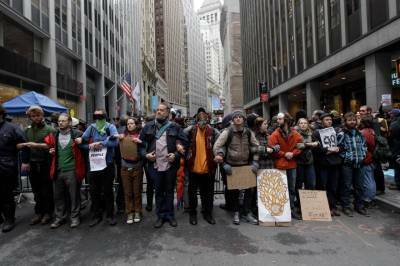 a small group of Occupy Wall Street activists engaged in a near-successful corrida against the Wall Street Bull. The matador and the bull both survived to fight another day. Street theater, pictures worth thousands of words, a spark in the growing fire. Another spark was the article on OWS joining an Assembly of Struggles in Athens. Those gathered in a basement in the neighborhood of Exarcheia talked about parks, public kitchens, and barter bazaars. They even seemed pretty hopeful. A common theme, a common trajectory of events that echo Thomas Jeffereson's prediction of things to come. The Greeks are a bit ahead of we Norte Americanos on the revolution curve, the Argentinians are well ahead of us all. Today another technocrat was installed by the bankers in Italy. As Benito Mussolini once said, "Fascism should more properly be called corporatism, since it is the merger of state and corporate power." That evening’s meeting in Athens is hopefully a sign of things to come: a global resistance movement coming together to face global problems. It’s being built right now around the particular needs of local communities, of people who are learning to organize themselves and resist in the course of providing for one another. Street theater in NYC, organizing in Athens and sad news from Burlington Vt. and Oakland where, like Vancouver, tragedy, wrought of our culture's woes, has landed on the occupiers door step. Don't cry for Greece let alone Argentina. 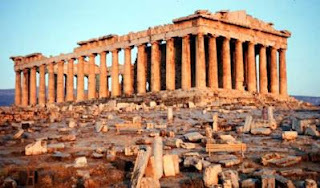 The bankers have nearly completed their coup in Greece. 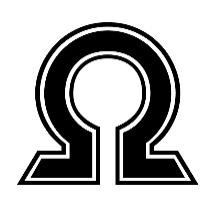 But this lamestream economy is less revelant each day in Greece and beyond as a global resistance movement is being built around people who are learning to organize themselves and resist in the course of providing for one another. The bankers will squeeze Greece dry, the protests will only get bigger. Each day the center of power in Greece moves to the street. The Greeks will rise, the bankers will fall. This spirit of building the world you want is gaining momentum here at Occupy Vancouver which has become a downtown eatery serving hundreds of meals a day dished up to all comers as donated food rolls in. Staffed totally by 20-30 rotating volunteers who are building a new world one meal at time. They say, "Come on down and Join Us'. 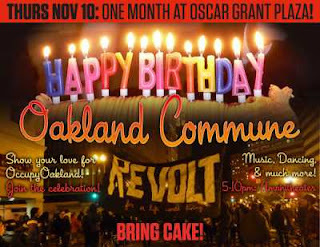 Then there's Occupy Oakland's 1 month old Birthday Party today and tonight in the Amphitheater of Oscar Grant Plaza. It'll be livestreamed, it'll be fun, it'll be another little spark in the global resistance's spreading flame. In the video below musicians Graham Nash and David Crosby play an acoustic set for members of Occupy Wall Street in Zuccotti Park on Nov. 8. It moved me to tears this morning. The Occupier's Only Demand is: Join Us! Somehow the Occupy Movement has managed to change the political monologue into a dialogue or a multilogue more accurately. 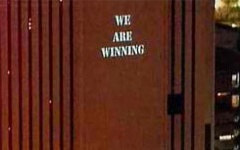 There are, seemingly, as many different issues, strategies and tactics as their are occupiers. Somehow the occupiers have organized themselves into a horizontal-inclusive community despite the choas of daily events unfolding around them. Somehow they've managed to issue only one real demand: JOIN US! Being an oldtimer, set in my oldtimer ways, i'd have tried to organized clear demands. The Robin Hood Tax...Mandatory Labeling of GMO Foods...The End of Corporate Personhood...etc. Trivial, misleading oldtimer type divisions that obscure the fact they are all part of the same issue. Occupy's Statement To the Media: Our struggle won’t fit in a 15 second soundbite. This occupation is a beginning, and we have a long way to go. And while we have much in common, we believe the people are stronger united behind many banners, rather than a single one. says it perfectly. The video below could be David Suzuki's finest hour. This should be watched by the whole world. The most promising story line this afternoon isn't the impending showdown being hyped in the lamestream media it's the behind the scenes negotiations between city managers and Occupy Vancouver. Councillor Andrea Reimer confirmed negotiations have been going on since day one of the protest in an interview with The Independent, and that moving the camp indoors is currently on the table. “We’ve been talking with people from the movement since day one, the deputy city manager has been the lead on it,” Reimer said. “[The Art Gallery grounds] is not an ideal space. If they had somewhere with concrete, that drained a little better, that would be a better space for such a thing. I know that that discussion has been going on. Facilitating the movement itself would probably best be done from an indoor space where they could have things like offices.” Reimer said. Of course i have no idea if the occupiers would agree, that would require much horizontal discussion, twinkling and a vote. But it is a hopeful sign, perhaps Vancouver can be a vanguard for the co-operative model that yesterday's stories from Occupy Halifax and Olympia examplified. This could be a model for so many other occupied locations now heading into winter. Imagine the difference in tone co-operation would bring over confrontation. Imagine the difference one successful co-operative solution could bring to what now seems like the kindling of a soon to be out of control fire. Vancouver's Adbusters called the people to this growing occupation movement, now, hopefully, Vancouver's occupiers will propel the movement foward. Occupy Vancouver to Move Indoors - According to a key Occupy organizer, protesters are in negotiations with the city to move to a warehouse following the shut down order issued by Mayor Gregor Robertson. Occupiers are stirring the pot, everyday now there are so many issues on so many fronts it resembles a candling forest fire in a strong wind. So many stories everyday that a person can go with those that are the best fit with their paradigm. Today's news cycle includes a number that fit mine. One is where the Washington troopers took to heart the radical notion of 'protect and serve' and helped set up tents at Occupy Olympia. Another is from Halifax where Occupy Nova Scotia protesters camped outside Halifax City Hall put down their placards and bongos Sunday and picked up brooms, sponges and dishcloths instead. The demonstrators started a cleanup prior to a temporary relocation that will allow Remembrance Day ceremonies to go ahead at the city's main cenotaph. Oakland, Atlanta, Vancouver, Chicago, San Diego, Bloomberg and others are watching hopefully. Their aren't two sides, everybody is in the 99% boat. First came Albany now Olympia and Halifax are visible models of co-operation but they are only a few we've heard of. There are thousands of ongoing occupations the vast majority are peaceful, community supported, protests. Occupy Vancouver is under pressure right now. The occupiers sound determined to stay. Occupy Vancouver providing a number of valuable services to the homeless, their schedule of daily events shows a level of organization to be envied and, with any luck, cloned by occupiers everywhere. 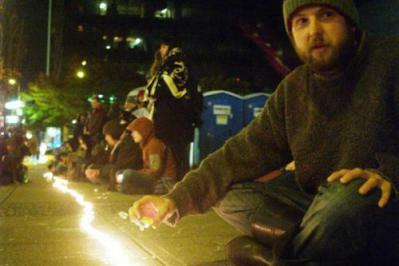 Occupy Vancouver in Shock After Death. Occupy Vancouver medic Chris Shaw was the first-responder on scene, and unsuccessfully attempted first aid on the deceased woman. Within hours, protestors began a candle-light vigil - with signs reading "We are all Ashley" - was held in front of the art gallery on Georgia Street. It appears Ashley died of a drug overdose. Another occupier said the incident is reflective of Vancouver's drug addiction crisis, not Occupy Vancouver, a protest against the very economic and political system that creates the conditions for drug addictions. "This is a better, safer shelter than any other shelter in the city. That's why people are here -- shelter, education, free food. Nothing that happened here is a product of this movement." 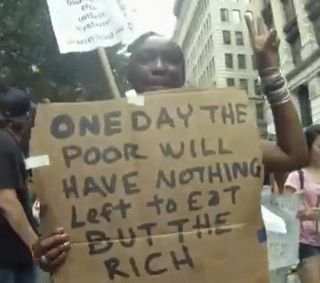 - said Occupy participant Blaine Komatic. Their have been 120 deaths from drug overdose in downtown Vancouver during the past year. Not once did either Gregor Robertson or Sunan Anton call for the closing of the downtown slums because of 'safety'. This poor girl's death is being used as a red herring to divert attention, as all red herrings are supposed to do, away from the issues of homelessness, hopelessness, poverty, inequality and despair. Occupy Vancouver is undoubtedly the safest place to survive as a street person in Vancouver. If there were no election run going on Gregor Robertson would be going all 'liberal' on this issue. If the Olympics had actually delivered on it's pre-spectacle hype there would have been far more facilities available for Ashley. Instead she and others have voted with their feet for the imperfect community growing in the 'occupied' bits of ground here and around the world. Tragic death rocks Occupy Vancouver site - A woman at the Occupy Vancouver camp died Saturday after being found in an "unresponsive" condition, police said. A Canadian protest organizer said it appeared to be the result of a drug overdose. If you're looking for something cool to do, Saturday is Move Your Money Day. Or Bank Transfer Day. Or Dump Your Bank Day, lottsa names. November 5 has been marked as the unofficial date for unhappy customers to take their dough outta the big banks and move it into smaller, more local co-ops and credit unions. Moving your money is a bigger issue in the US and Europe than here in Canada. Canadian bankers have had their greed machine throttled back by regulations passed by Chretian and Martin years ago they couldn't avoid or bribe their way out of. Though muzzled some by regulations Canadian bankers still do their best to serve the interests of their wealthy shareholders. So do Credit Unions serve he interests of their shareholders. The difference is you and i, the members, are the shareholders. In what could be the first practical request by the Occupy Movement yet, protesters are asking everyone to take part in the "Move Your Money Day" and divert their investments from big banks. Moving your money is a small act of individual enpowerment. It feels good to act, Move your money! i did. The local Credit Union people were pleasant and helpful. The Greeks were never really going to be given an oppurtunity to vote on the bankers deals, it was all a ruse to give Papandreou an honorable way out. "The referendum was never an end in itself," George Papandreou earlier told the cabinet according to statements released by his office. Mr Papandreou also insisted he would never have put the question of whether Greece stays in the eurozone to a popular vote, as the leaders of France and Germany had suggested. Of course not, even in the birthplace of democracy, the people can't be alllowed to vote, not an honest vote like a referendum could've been for sure. Today's mainstream media headlines about Greece all mention the 'market surge', another good day for the bankers another bad day for the working class Greeks. Greece's economy is being sucked dry by the banks. The Greeks marching the streets know what's going on they would have soundly voted to get out. One day, IMO, they still will get out either by walking or via the boot. It's interesting to follow Argentina's history in light of Greece today. Argentina defaulted amid huge moaning by the same banks that had continued to lend huge sums and watched successive military juntas buy weapons with some and steal the rest. Finally Argentina rolled over and played dead, their bonds-their debt-became worth 20 cents on the dollar but instead of collapsing since then they've prospered. Venezula bought Argentina's near worthless bonds, began bartering oil for food with Argentina, Argentina's industry was able to sell its output in devalued dollars, tourism cost half what it had before. Now Argentina was booming, their not so long ago junk bonds 'surged', Venezula sold theirs and doubled their money. No wonder the yanks hate Hugo Chavez eh! Europe's Own Arms Dealers and Loan Peddlers Took Down Greece - Profit-hungry bankers, weapons makers pushed EU member over brink. Greeks' Choice — and Ours: Democracy or Finance? - Greek Prime Minister George Papandreou decided in favor of democracy yesterday when he announced a national referendum on the draconian budget cuts Europe and the IMF are demanding from Greece in return for bailing it out. What difference 12hrs can be. Went to bed, things were cosmic. Got up, flames and riot cops. Too bad. Both sides of the barricades have divisions. The occupiers, as they're signs kinda show, are a diverse bunch. The vast majority are trying to pull off a peaceful, horizontally organised, leaderless revolution. A few though, like it was in the first Vancouver Olympic protests and others, show up mostly to smash windows and light bonfires. The Cops have got their own issues. Their Union issued an open letter: Open Letter to the Citizens of Oakland From the Oakland Police Officers Association; Interview w/ Union which says in part: "We represent the 645 police officers who work hard every day to protect the citizens of Oakland. We, too, are the 99% fighting for better working conditions, fair treatment and the ability to provide a living for our children and families. Then, after a peaceful historic day where they too were looking like heroes, over react. 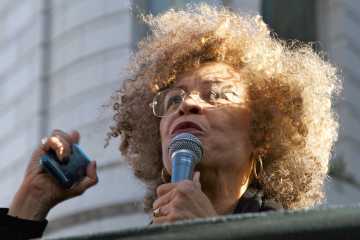 Each individual cop is caught in the middle, they've got jobs/careers to protect but are definately a part of the 99%." #Occupy Oakland didn't riot, a small group did, but the relative morality of different tactics is on a gradient scale, some how the occupiers must horizontally deciede the way foward. Remembering, hopefully, the experience of the G20 in Toronto which suggests that the more likely scenario is that elites will plant distruptive police provacteures. Maybe it was spy vs. spy, cops vs. cops in the pictures last night. The cops, OPD and beyond, hopefuly again, will be informed by the Nuremberg Trials where it was decieded each person has the duty to disobey an immoral order, to follow their conscience. Their oath says 'serve and protect', nothing about being the army of the 1%. Like the veterans who's oath includes to protect again enemies both foreign and domestic and who now are occupiers because they now see the corporate power as abdomestic enemy,, the police have to deciede who's interests they are serving and protecting and follow their conscience. A group, estimated by local media outlets as large as 20,000, marched from Oakland's central intersection to the city's port and successfully shut down the Port of Oaklsand. Police Move in on Oakland Occupiers - Shortly after 1:30 a.m. police were ready to move in on the Occupy Oakland camp at Frank H. Ogawa Plaza and announced that arrests would be made. At least 100 tents are housing hundreds of people there. This very cool, it's noon and i'm watching the livestream from Oscar Grant Plaza in one browser screen and typing into the other. Another of life's contradictions. The General Strike couldn't be without the corporations that made the gear. Facebook, Twitter, Youtube etc. take huge expensive servers that need specially built warehouses to run. Without all of them we'd be hearing about this two days later like we did in the 60's. The live chat running beside the livestream is very neat too. People all over the world are watching/listening to this and other streams and youtube video from the streets. All kinds of different folks, kids, dogs, music, chanting...praises to #Occupy Oakland, these folks are carrying the ball for us all. UPDATE ﻿9PM: Weary protestors are heading home on the Bay Area Rapid Transit [BART] after a fantastic day that was peaceful and raised the exhilaration level of the universe. The day climaxed when 15,000+ marchers closed the Port of Oakland when the longshoremen refused to cross their picket line. Some occupiers are also heading back downtown to the park and plaza and a well deserved good night's sleep in their tent city.. The General Strike was a huge success. Praises have rolled in all day on the chat line from thousands of livestream watchers from around the world. Who could ask for anything more. Tomorrow's General Strike call by the Occupiers in Oakland has lifted the spirits of millions everywhere around the world. My body can't be there tomorrow but my spirit will be. There's two words that the mainstream media won't utter, 'General Strike'. The corporate media will try to measure the success of the strikers with a number - a few thousand-tens of thousands-hundreds of thousands-a million[my hope]. Numbers miss the point. The fact is the internet is alive with hope today like i've never seen it before. "The whole world is watching Oakland". i'm hoping to see lots of brown and black faces, as well as white, of all genders [male/female/trans/etc], young and old, veterans, off duty cops, union and non-union, suits and hippies - the rainbow nation in full regalia. Let November 2nd be a historic day. 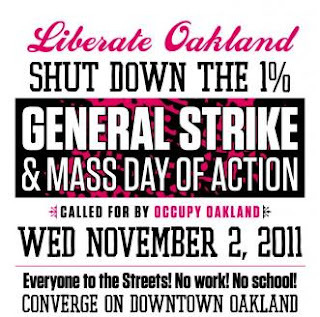 Let millions of my fellow Americans join the General Strike all across America and around the world. Let freedom ring from every town and city everywhere. Let the members of the Oakland PD remember that they too are brothers and sisters in the great 99%, that we are all in this together. Let them refuse to continue to act as the army of the rich. Let the 1% tremble. Let this be the day we've always waited for.